An "If" part that specifies the conditions that have to be matched for the rule to be triggered. Most of these criteria directly or indirectly relate to properties of the message, for example. 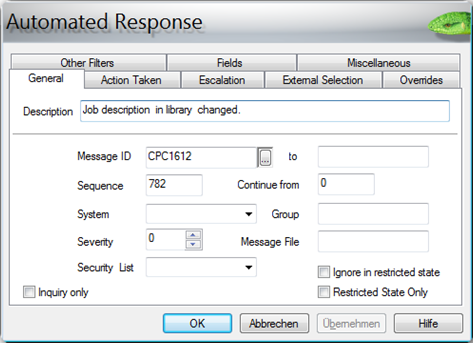 the message ID or the name of the job that issued the messages. A "Then" part specifying which actions to perform when the rule is matched. A descriptive section that contains the rule's "Description" (that is, its name in a format that's easy to read) and a sequence number. Rules are processed in the order of their sequence number. … what you see is in fact a mixture of elements from the If, Then, and descriptive parts of the automated response. When you edit automated responses, it's very useful to have this distinction into If, Then, and Descriptive in the back of your mind. 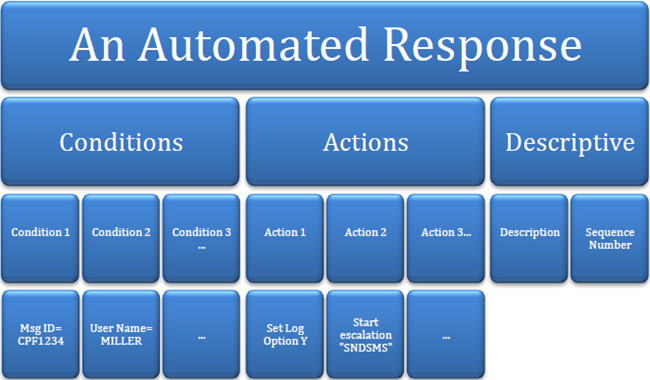 Any setting you make on an automated response falls into one of those three categories. The following chart depicts this structure. You can use the following table as your reference to the various settings in the Conditions (If), Actions (Then) and descriptive sections of automated responses. The settings are ordered by the tabs of the Automated Response dialog on which they appear. Think of it as your map to automated responses.